in our studio. Somehow we managed to not have any images form the faire. but they all pull even in the current state. 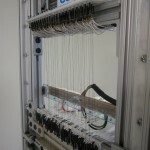 Individual muscle wires to Centipede. 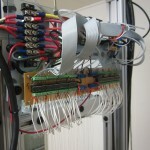 We no longer use the shift register circuit. Beater mech runs now smooth. We are now using a 1600W power supply which gives us enough power to expand to 320, which is our next step once we are back in the states in August. 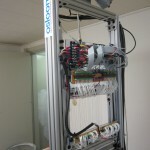 We have been on osloom hiatus since Mini Maker Faire as we are currently on a Fulbright/Artist-in-residence at quartier21/Museumsquartier in Vienna (working on a different project). 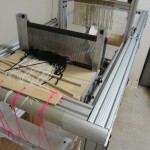 One side effect of the muscle wire actuators is the fact that the loom is so quiet (it is a bit uncanny). 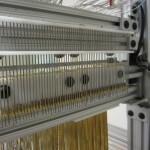 Upon our return we will meet with Nathan and Chris and get the kinks out to accurately weave with 64 threads. The main problem remaining is to design the heddles more accurately and we will be working on that in August but probably a bit thru fall as well. 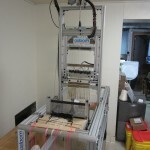 Once we get back to the US we are going to start the documentation of the hardware and schematics and releasing as we get them tweaked and finalized – the electronics and software will come out first while we tweak the heddles). As far as timeline, we are looking by the end of Fall 2013. Again our sincerest apologies this has taken so long but since this is all based on volunteer labor and this is complicated at best. Once the plans are good to go we hope some of you will help develop and refine for the full scale osloom. Thanks for your continued support (and incredible patience). Margarita, Markus and the osloom team. Join the OSLOOM mailing list for email updates! 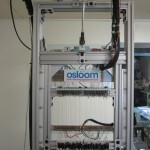 OSLOOM is a project intent to build an affordable open source jaquard loom for studio weavers.